In a workshop, the Turtles are busy forging something from pieces of metal. Later, a Foot Elite Guard spies on a unit of Foot Soldiers as they race across the rooftops. Much to his surprise, he sees that they are being led by none other than… the Shredder? In the hospital, the old man continues to monitor the horrible events in Sarajevo and then hobbles back to his room on a walker. At Graham’s Goodtime Grill in Colorado, Casey’s getting a cup of coffee when he notices his Chevy pull up into the parking lot. Out step the two thugs who stole it from him in the first place. Casey runs out into the lot and lays the hurt on the thugs. Before he can retake his Chevy, though, he has to deal with a scrappy little Chihuahua. Casey punts the dog over the restaurant’s sign and drives off in his Chevy, reminding the thugs that not long ago he'd have hurt them FAR worse. In the abandoned smokestack, Splinter has finally regained enough strength to walk again. He feels he’s ready to leave, though he wishes he could thank the Rat King for leading him through his crisis. 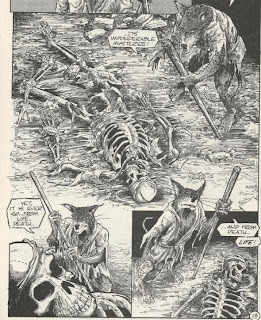 Suddenly, he stumbles upon the Rat King’s skeleton and realizes the truth. Splinter considers the cycle of life and death and then climbs his way to freedom. On the road, Casey hits East 70 with his newborn baby in tow. In New York, April and Robyn take one last look at the condemned Second Time Around shop. They hate seeing it like this and look forward to its demolition. They realize that things change and nothing lasts forever. The two sisters say goodbye and as Robyn heads to the airport, April heads into uncertainty. Inside the Second Time Around shop, the Turtles and the Foot are taking a break from their rooftop run. Raph asks the Shredder why they stopped at the shop and the Shredder (who is Karai in disguise) tells the Turtles that she needed to see the place where it all began; where the Turtles' defeat at the hands of the Shredder spurred them to kill him in return and thus ignited the Foot civil war. Leo finds an old photo of April and Casey and suggests they get a move on before the Elite Guard track them down. Right on cue, several Elite Guards drop down through the roof. 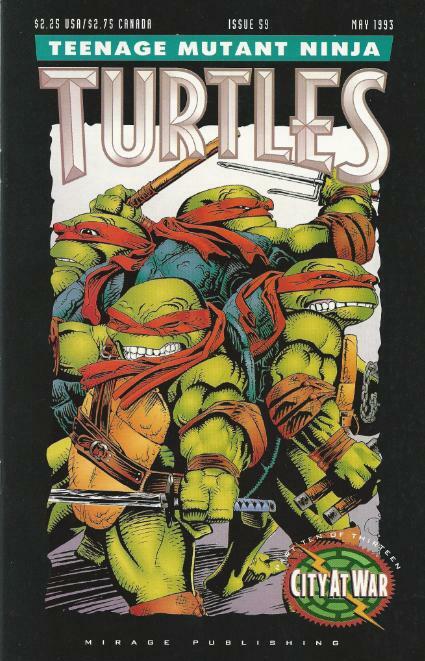 *This story is continued from TMNT (Vol. 1) #58. 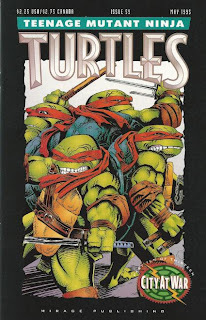 The story continues in TMNT (Vol. 1) #60. *Casey’s Chevy was stolen in TMNT (Vol. 1) #51. *The dog that bites Casey’s leg is Inky, a character created by Eric Talbot who appeared frequently in Archie’s TMNT Adventures comic. *The Rat King was killed in Tales of the TMNT (Vol. 1) #4. His spirit will appear next in Tales of the TMNT (Vol. 2) #65. 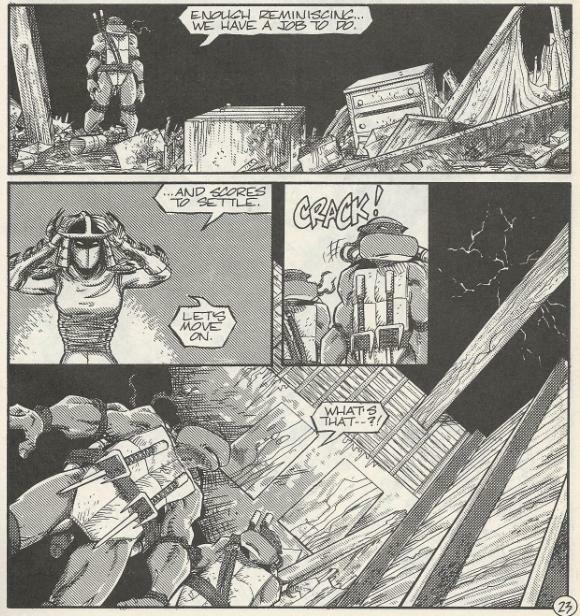 *The Second Time Around shop was burned down by the Foot in TMNT (Vol. 1) #10. *How did that photo of April and Casey find its way into the rubble of the Second Time Around shop? April and Casey didn’t meet each other until the moment the place burned down. *The opening editorial teases a potential crossover between the TMNT and the titles from Mirage’s superhero-centric NEXT imprint (Bioneers, Xenotech and Stupid Heroes). The NEXT imprint floundered quickly and no such TMNT crossover was ever produced. Now that all the characters have been hurt and all the characters have been healed, all the characters can begin moving on with their lives. They’re uncertain as to where they’re going to go, but they’re all ready to get there (well, except for the Turtles, as they have one more battle left to endure). Casey’s headed home with not only his baby and his old car, but all the life lessons he learned over the past year that have helped him grow up. April’s not sure what she’s going to do, but she has plenty of financial capital to see it happen. Splinter has been effectively humbled and is ready to head back to civilization or whatever passes as civilization for a mutant rat. Yep, everybody’s ready to get back on their feet except the Turtles. They’ve got one last loose end to tie up. And speaking of their part in this issue, I really appreciate how Laird and Lawson (the scripters) didn’t try to pull a fast one on the audience by trying to make US think that the Shredder was back, too. 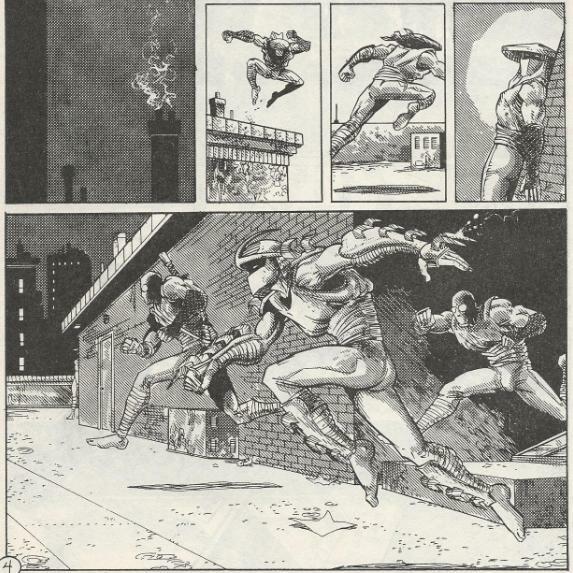 While it isn’t explicitly stated in the opening scenes; the Turtles working in a metal shop followed by a feminine-looking Shredder running the rooftops did a nice job of silently imparting the nature of their scheme onto the audience. And when Shredder shows up with them later, Raph refers to her as Karai in the very first panel so there's no pretense of outwitting the audience. And I'm glad, too. If they’d actually tried to “trick” us it really would have brought the whole issue down. I suppose if I have any trouble with this issues, it's that it basically begins a string of coincidences and happy accidents that more or less reunite the cast and reestablish the status quo and they can feel a bit contrived. Here, Casey just happens to be at the diner at the right time when the guys who have been joy-riding in his Chevy for a year just happen to pull up in it. I was a little incredulous at such happenstance and it isn’t even the worst we’re going to see. The cameo from Inky was random but neat, though. So all the arcs save the Turtles’ are beginning to wind down with this issue as we slowly but surely get the gang back together. Still, the main event isn’t quite over with.